I finally moved from http://www.lalalapatricia.info to http://www.lalalapatricia.com. Yey! It's not that big anyway but hey it's something to a blogger. Taking some risks with the stats and all is something to be worried about but I know everything is worth it! This 2014, Don't be afraid to take some risks! At least you did something than doing nothing. I want to inspire young mom like me to continue on dreaming and to keep a positive outlook in life. Nothing is impossible with God. Believe in him, believe in yourself! And also I want to inspire more to all the ladies out there who loves fashion. You don't have to wear something you are not just to be in, being yourself is enough! So, Let me share a positive vibe to everyone by collaborating Rhea to an amazing year-ending giveaway! We want to thank all of our readers for always supporting our blogs and let's all welcome 2014 with a big smile on our face! For this giveaway, We’re picking 2 lucky readers. 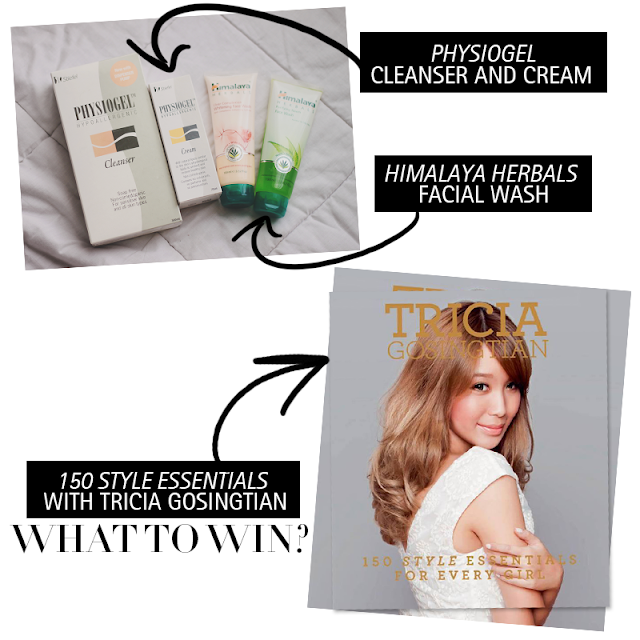 1st winner (BEST 2014 RESOLUTION) will get the Physiogel Cleanser and Cream + Tricia Gosingtian Style Book. 2nd winner (random) will get the Himalaya Herbals products + Tricia Gosingtian Style Book. Giveaway open within the PHILIPPINES only. Giveaway ends on January 1, 2014 12mn. Winners will be announced IMMEDIATELY.